Did an Untamed Coal Fire Sink the Titanic? A new documentary reignites theories about a well-documented coal fire’s contribution to the infamous ship’s demise. On 1 January 2017, the United Kingdom’s Channel 4 premiered a documentary titled “Titanic: The New Evidence”. Numerous outlets reported on the story it presented with some variation of “New Evidence Suggests Iceberg Didn’t Sink Titanic” as their headline. More precisely, however, the documentary presents the theory that a long-lasting, smoldering coal fire was responsible for both weakening the RMS Titanic’s defenses to an iceberg and also for its high rate of speed prior to its impact. This does not preclude an iceberg, which is still very much in the mix. The documentary follows Senan Molony, a reporter who has researched and published numerous books on the mighty vessel. The theory, which is not quite as original as it has been reported to be, is built around newly unearthed photos of the ship prior to embarking on its maiden voyage, a fresh look at the testimony of a number of officers and survivors, and observations provided by computer models that purport to illuminate what structural damage would have been like had there been a smoldering coal fire. By way of a very streamlined description, the theory rests on three assertions: 1) Prior to leaving the port where it was constructed, a spontaneous coal fire broke out in one of the Titanic’s coal bunkers that remained lit during much, if not all, of the ill-fated journey; 2) the crew attempted to extinguish the fire by burning coal at a faster speed; 3) the Titanic’s fast speed combined with structural damage caused by the fire made what would have been a survivable collision with an iceberg a catastrophic disaster. Self-heating of coal, that is to say, an increase in the temperature of the coal, occurs when coal is exposed to air at low temperatures. The reaction between coal and air is a solid-gas process that involves the reactions of oxygen at reactive radical sites on the surface of the coal. […] The rate of oxidation is generally very slow at ambient temperature, but it increases exponentially as the temperature rises. If the heat generated by oxidation is not fully dissipated, then it is absorbed by the thermal capacity of the coal, raising the temperature of the coal. Provided that there is an adequate supply of oxygen, an accelerating process can then occur, known as thermal runaway or runaway ignition, in which the release of heat raises the temperature of the coal, which augments the rate of oxidation, which produces more heat, which cannot be dissipated, which increases the temperature of the coal, etc. If this process proceeds unchecked, a runaway ignition event can ensue and subsequently initiate a fire. As Molony points out in the documentary, there are a number of compelling eyewitness accounts attesting to the presence of a coal fire prior to the Titanic’s maiden voyage. Most compelling, perhaps, is the testimony of a member of Titanic’s fire crew named John Dilley. This provides a large part of the evidence for that claim. The photographs were discovered by a descendant of a director of the Belfast-based company, Harland and Wolff, that built the Titanic. About four years ago, a collaborator of Mr. Molony’s acquired the rare photographs of the ship, meticulously taken by Harland and Wolff’s engineering chief before it left a Belfast shipyard. When the two men looked closely at the images, Mr. Molony said, they were shocked to discover a 30-foot-long diagonal black mark on the hull’s front starboard side, close to where the ship was pierced by the iceberg. An analysis by engineers at Imperial College London subsequently revealed that the mark was most likely caused by a fire in a coal bunker of the ship. This marking, it turns out, is located where the #6 coal bunker would be, which was both the location of the primary bunker fire, and is also the place that the iceberg struck, Molony argues. Evidence that firefighters dealt with the coal fire by burning coal at a faster rate, causing the Titanic’s high speeds. Why was the ship at full speed under those conditions? It was not trying to set a cross Atlantic speed record; the ship was designed for luxury, not speed. The answer may be a smoldering fire in coal bunker #6. 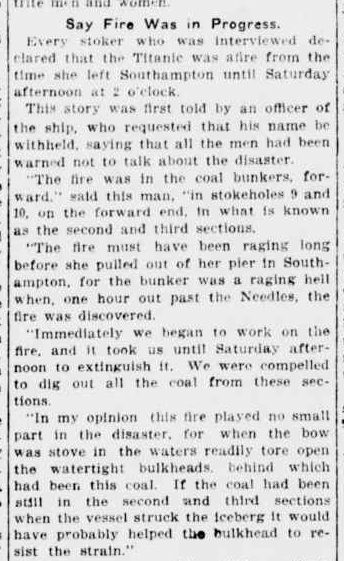 Spontaneous ignition of coal in seams, culm banks, and bunkers is well-known with a long history. At full speed, the bunker fire would have had a net drawdown rate of the order of 1-in/hr. At this rate, a fire that originated in the top half of the bunker would still have been in the bunker at the time of collision. Two dimensional computer models for the initiation of fires in coal piles are used show a possible behavior pattern relevant to the Titanic bunker fire. The documentary uses the testimony of another Titanic firefighter named Charles Hendrickson, who stated to the official British enquiry that they didn’t begin fighting the fire until they departed Southampton on Titanic’s maiden voyage, to bolster the point that the fire had to be dealt with during, and not before, the voyage itself. This fact, the documentary argues, would have necessitated an even faster rate of coal removal, and therefore even faster speeds. The documentary combines this information with commentary from maritime historian, author, and engineer Richard de Kerbrech, to suggest that dwindling coal supplies prevented the ship from stopping or slowing down. This aspect of the theory, however, is among the more speculative components of the documentary. The second previously presented aspect of the new combined story proposed by Molony is that this fire damaged what was meant to be a waterproof seal used to keep the ship from taking on too much water. Question: The bulkhead forms part of the bunker – the side? – Yes, you could see where the bulkhead had been red hot. Question: You looked at the side after the coal had been taken out? Question: What condition was it in? – You could see where it had been red hot; all the paint and everything was off. It was dented a bit. Question: It was damaged, at any rate? Question: Was much notice taken of it. Was any attempt made to do anything with it? – I just brushed it off and got some black oil and rubbed over it. Question: What was the condition of the bulkhead running through the bunker? — It was damaged from the bottom. — The bottom of the watertight compartment was dinged aft and the other part was dinged forward. Question: What do you attribute that to? Question: Do you mean to say the firing of the coal would dinge the bulkhead? The implication made by the inclusion of these two accounts in the documentary is that the fire broke a watertight seal between a coal bunker and a bulkhead, making it impossible for the Titanic to stay afloat. This is where the documentary’s second bit of newly introduced “evidence” comes into play. The documentary attempts to demonstrate the plausibility of those accounts and this mechanism by employing the efforts of Imperial College London fire expert Guillermo Rein and University of Birmingham metallurgy expert Martin Strangwood. Based on what were described only as “experiments in my lab”, they provided computer-generated images that suggested the bulkhead wall could deform in a way that could plausibly be described as having one part “dinged aft” and another part “dinged forward.” This scientific investigation’s methods have not been published in a scientific journal or further peer-reviewed, so this aspect of the work — while potentially compelling — is challenging to verify. Titanic: The New Evidence does not provide as much new evidence as the title may suggest, but it does bring together various alternative theories about the cause of the Titanic’s demise into an entertaining, if not compelling, single narrative. The question ultimately comes down to this: Would it have sunk anyway, or does the ship’s sinking actually require the coal fire as an integral part of that process. Not everyone agrees on the answer. A fire may have accelerated this. But in my view, the Titanic would have sunk anyways. Whether the coal fire played a role in both the speed and the structural failure of the Titanic prior to its collision, or whether both mechanisms are needed in concert (or at all) remains an open debate. 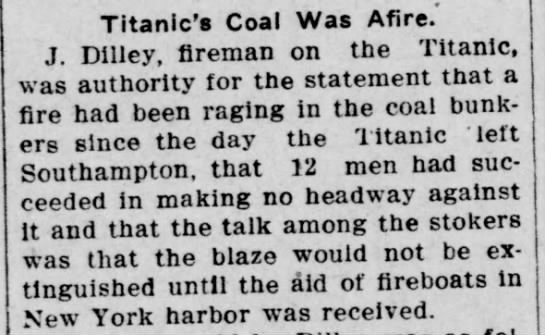 That there was a smoldering coal fire on board even before the Titanic’s maiden voyage, regardless of its contribution to the disaster, however, is a remarkable bit of trivia in its own right. New York Tribune. “Titanic’s Crew Praise Mates Who Were Lost.” 20 April 1912. Essenhigh, Robert H. “What Sank The Titanic? The Possible Contribution Of The Bunker Fire.” Geological Society of America Conference, Denver. 2004. “Mistakes Made By Wireless Cost Lives On Titanic.” 26 April 1912. Reviews in Engineering Geology. 2007.